Mr. T and I just had our one year anniversary in our apartment. Lately I've been looking around and wishing to spruce our little space up a bit. I dove into two projects this past week, and they were both a complete success. Project #1: something for our very plain front door. To make the wreath, I started with a grapevine wreath. We have a giant front door, so I selected the 18" wreath. If you have a normal sized door you'll probably want to use one that is 12". The only other supplies I needed were a package of 200 small natural colored coffee filters, a low-temperature glue gun, and ribbon. 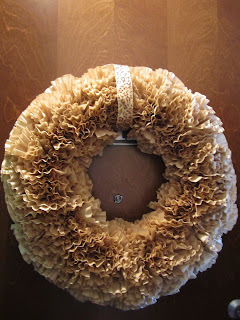 Start by applying a dime-sized amount of hot glue in the center of a coffee filter and press it into the wreath. Repeat this step with all 200 filters. Make sure to place each filter close to each other so you won't get any holes. And that's it! I found some snazzy leopard print ribbon I had left over from Christmas time do adorn the top. Here's the final product. Stay tuned for my next around the house project. Here's a preview of what it looked like during the creation stage. Any ideas of what it could be? You'll be shocked at what the end product looks like.